Successfully Added Digital Clamp Meter to your Shopping Cart. This clamp meter enables you to accurately measure electrical currents travelling through wires without having to cut the wire. This clamp meter is completely safe to use because there is no need for you to cut the wire in order to get a reading, unlike other multimeters, were you'll have to cut your circuit in order to take your measurements. The major advantage of this clamp meter, is the accuracy of reading live electrical readings of live wires without interrupting the operation of whatever is running off the circuit. This clamp meter is great for testing loads on circuits in both residential and commercial environments, and is perfect for electricians, technicians and engineers. And with its LCD display, and easy to use functions you can see your result instantly. Click "Add to Cart" now, and we'll express ship you a sample to see for yourself how convenient this clamp meter really is. This Digital Clamp Meter is brought to your by the leaders in wholesale factory direct China Electronics, Chinavasion. Note: This great new product is available with factory direct low china wholesale price . It is stocked in our warehouse for immediate order fulfillment and worldwide shipping to any destination whether it's you or your customer. When working with electricity, always use proper safety techniques. 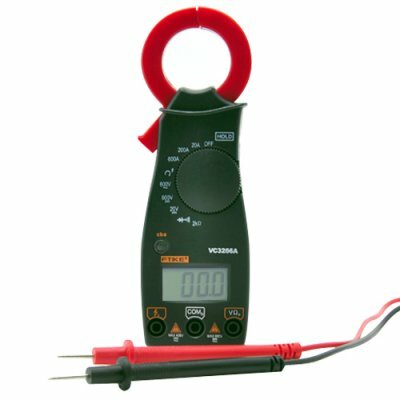 How do you measure current with a digital clamp meter? To measure electrical current with this digital clamp meter, just follow these simple steps: 1- Remove power from the circuit, if possible. Working on a hot circuit involves extra risk to the user and all equipment involved. 2- Isolate a wire carrying the current you wish to measure. 3- Open the clamp portion of the meter and then close it around the wire (and only that wire) you wish to measure current passing through. 4- Set the clamp meter to read the current type (AC or DC). 5- Return power to the circuit and read the digital display, writing the value down to avoid repeating the process. If the reading fluctuates, give it a minute to settle down. Finally, Remove power from the circuit. Then remove the clamp meter. Can this handheld Clamp Meter be connected to a computer? This clamp meter is completely portable, it comes with an LCD screen that displays your reading, no computer or any software installation is need, it will work straight out of the box.